Ginger Rolfes is a capital markets attorney who focuses her practice on commercial real estate and structured finance with an emphasis on originating loans for the commercial mortgage-backed securities (CMBS) market. 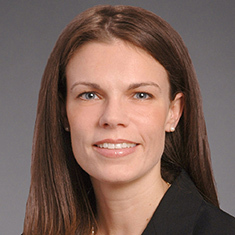 She also has experience with post-securitization loan servicing, syndicated lending, derivatives, construction lending, mezzanine lending, tenancy-in-common structures and Delaware Statutory Trust structures. Ginger’s more traditional real estate experience includes representing regional developers in the purchase and sale of commercial properties, negotiating leases on behalf of landlords or tenants and serving as local North Carolina counsel for real estate matters. While attending law school, Ginger was a member of the National Moot Court Team, the Jessup International Moot Court Team and the Order of Barristers. Shown below is a selection of Virginia’s engagements.